Fintan O'Toole & Joris Luyendijk came together to talk about what Britain’s exit from the EU might mean for Ireland, for the Netherlands and for Europe in an in-depth conversation about Brexit, and the conditions that may have contributed to the current state of affairs. 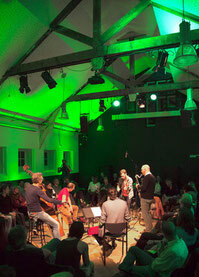 St. Patrick's Festival Amsterdam is an annual festival celebrating Irish Arts & Culture, with a special focus on music co-founded by Aisling Casey & Deirdre Daly in 2014. Held in the heart of the Dutch capital in The Netherlands, it is the only celebration of the richness and range of Irish culture in Amsterdam. The festival celebrates not only Irish traditional music, but also Irish music and musicians from other genres such as classical, pop, jazz and world, collaborating to present unique programs with Irish music as the inspiration. Since 2014 the Festival has welcomed Irish performers including Liam Ó Maonlaí, Mary McEvoy, Caoimhín Ó Raghallaigh, Ronan O Snodaigh, Mary Coughlan, Julie Feeney, Barry Douglas, Finghin Collins. Dutch performers include Ernst Reisiger, Dolf Jansen, Oene van Geel, Maarten Ornstein, Jeffrey Bruinsma, Wilmar de Visser among many others. Literaure, cuisine, dance, film and animation have also been featured in the programme and in 2019 for the first time, current affairs.